Enjoy the shimmer and shine of two of Pinnacle’s signature waxes! Pinnacle Signature Series II is the prince of carnauba car waxes with a pure yellow carnauba base and specialized reflective polymers, it is the finest carnauba wax in its class. Maintain its warm, wet glow with Pinnacle Crystal Mist Carnauba Detail Spray. Get them both in the Pinnacle Signature Series II Combo. Pinnacle waxes are made with the finest ingredients, including genuine Brazilian No.1 Yellow Carnauba and natural oils that enrich the paint. Enjoy the quality of Pinnacle in both a liquid and a paste with the Pinnacle Signature Series II Combo. Pinnacle Crystal Mist allows you to refresh and enhance the shine of Signature Series II within minutes. It contains real carnauba to boost gloss and reflection instantly. Signature Series II contains real Brazilian carnauba wax and special liquid crystal polymers for an enhanced jetting factor and wet-look shine. The carnauba paste wax creates a slick gloss on any color paint and it will not stain trim or molding. As always, Signature Series II has a buttery texture and inviting aroma that make it a pleasure to apply. It goes on effortlessly and buffs to a crystal clear shine. Signature Series II will not streak or cloud. Includes a poly foam wax applicator. Natural carnauba wax gives Crystal Mist Carnauba Detail Spray its distinctive, wet-looking shine. Carnauba, combined with crystalline polymers, creates sharp reflections and silky paint. This state-of-the-art carnauba-polymer matrix also enables Crystal Mist to bond to the existing wax for an instant but long-lasting gloss. On top of Souveran Paste Wax, Crystal Mist reactivates the existing wax so you’re not just seeing a surface gloss – you’re seeing the depth and dimension of multiple layers of carnauba. On a clean, dry vehicle, apply a thin layer of Pinnacle Signature Series II using the included poly foam wax applicator. The wax does not have to dry so work on one panel at a time. Buff using a soft, clean Cobra Microfiber Towel. After each wash or as needed, apply Crystal Mist Carnauba Detail Spray and buff using a Cobra Super Plush Deluxe Microfiber Towel. The soft microfiber towel has a deep nap that is ideal for quick detailer application. The Pinnacle Signature Series II Combo is an outstanding value. 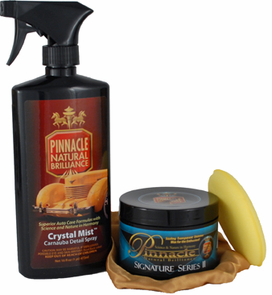 For just $10 more than the price of Signature Series II, you’ll also receive Pinnacle’s incredible detailer, Crystal Mist. Both products allow you to maintain a warm, reflective shine on any color vehicle. A total retail value of $87.98. Save $7.99 off the regular retail price!